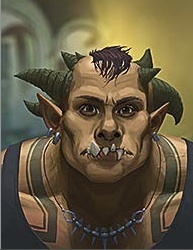 He is a slightly less burly troll, and a longtime friend and companion of Jerl’s. They have been collaborating musically for years, although both are only in their early 20’s. He generally is the more aggressive of the two, possibly compensating for his smaller size. Started Crod Stompaz with Harmony Craig Bottow. Plays the occasional memorial concert nowadays, but mostly does production work, under HCB Lives! Productions.